Ah, it's finally starting to feel like Fall here in Southern California. After the last few hot weeks, I'm eagerly greeting Fall!! The first thing that comes to my mind when I think about Fall and Winter is Egg Nog and cute coats and boots...I can't wait to pull mine out! 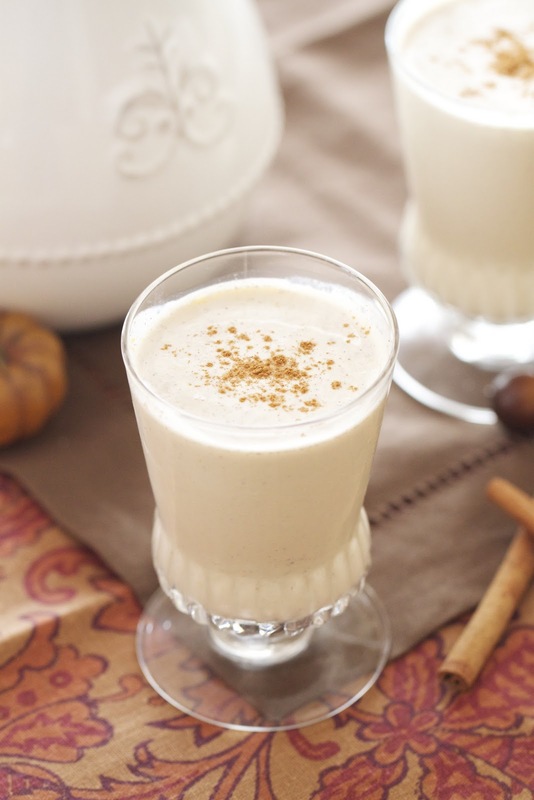 This delicious spiced egg drink isn't for everyone, but I promise you'll love mine! A friend was over for a play date, and I offered a small glass to her. She immediately refused and stated she didn't like the overly creamy drink. After repeated offers, she reluctantly agreed. Needless to say, she loved it! I've made many batches of egg nog from various recipes, none I was extremely excited about. I'm also slightly finicky about raw eggs, and most recipes call for the traditional raw eggs. Yikes! I cringe just thinking about it! Since raw eggs give me the hebby gebby's I par-cooked the eggs, which really adds (to me) a far less eggy taste. I'm also slightly obsessed with spices so I added lots of them! 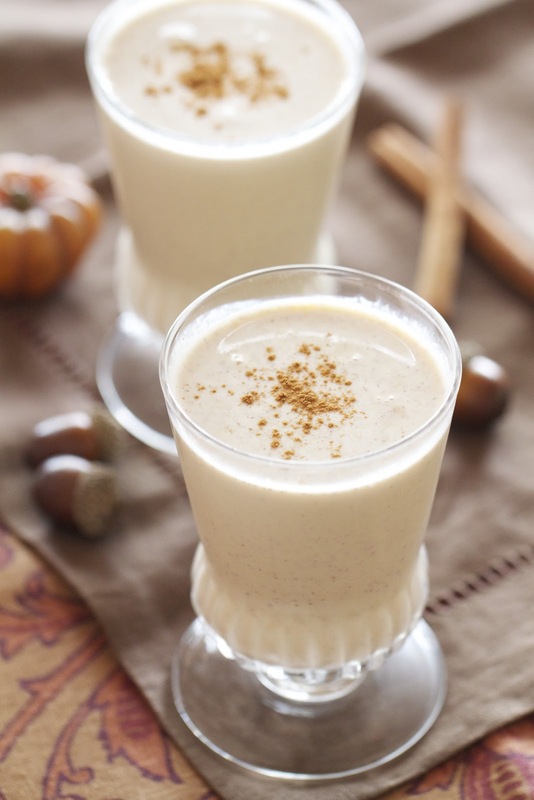 Bring on the Fall weather and enjoy this seasonal drink! It's always nice to half this recipe with rum and half virgin to share with your kids. My girls loved it!! 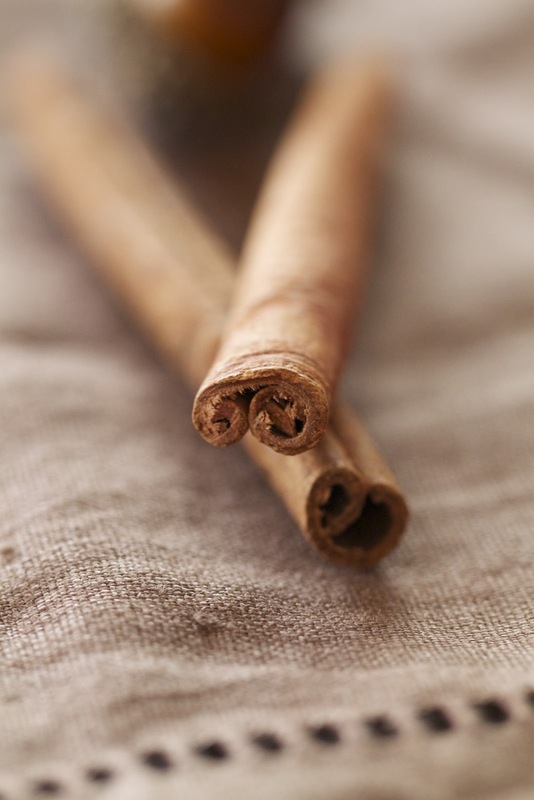 Over low heat combine milk, vanilla extract, cinnamon, cinnamon stick and clove in a medium saucepan. Rise the heat slowly and bring to a slow boil (it takes about 7 minutes to bring to a boil.) Once the milk mixture starts to boil take off heat and let the cinnamon stick seep for 2 minutes, remove cinnamon stick. In the bowl of a standing mixer combine egg yolks and sugar. Whisk together until pale and fluffy. With the mixer on low, pour the hot milk mixture into the egg yolks (tempering the yolks) whisk until well incorporated. Pour the mixture back into the saucepan and heat on med/med-low for about 5 minutes, continually stirring, until thickened and creamy. Do not let it boil, or the nog will curdle. Stir in the rum, heavy cream and nutmeg and refrigerate over night. When ready to serve garnish with a sprinkle of cinnamon. Your photos are absolutely beautiful! Every year we host many holiday parties and I usually just purchase egg nog. You have inspired me to make it this year! Thank you for sharing! I am definitely pinning this to my holiday pinboard! Like everyone else has already said, your pictures are beautiful! As for egg nog, I think raw eggs are absolutely disgusting. In cookie dough or cake batter is fine, but I don't understand how anyone could drink raw eggs. I guess they have strong stomachs. :) A friend of ours loves egg nog so we'll have to give this a try next time they come over! this looks delicious! thanks for sharing the recipe. I love your header. This looks ahhhmaazing! Perfect to get me in the holiday spirit. Oh wait, I feel like I have been for about the past 3 months! Gorgeous blog, thoughtful posts. You just made me a big fan! Mmmm that egg nog looks SO inviting!!! I love the spices and those pictures are just gorgeous! Nothing I love more than eggnog-yum! Wow. 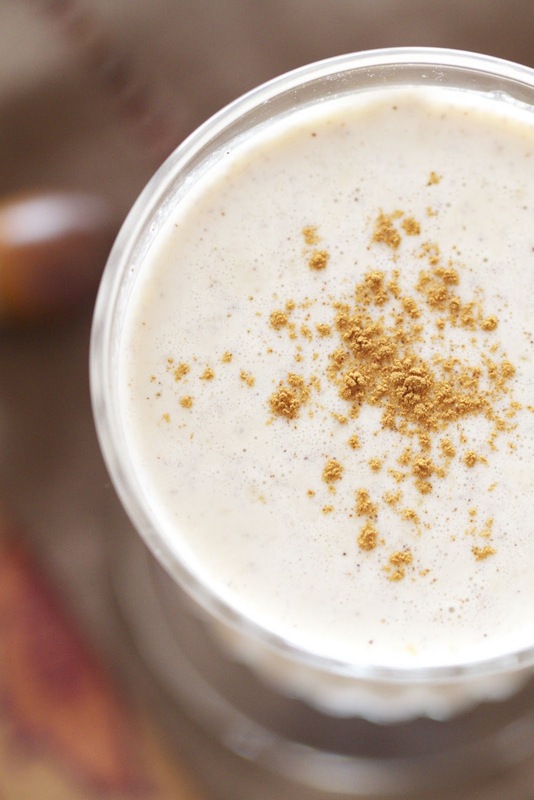 This looks like the most yummy fall drink. We had snow in Boston this weekend. I will need to make some soon. Did I miss the part where you par-boiled the eggs? How long did you boil them? And then does separating them work the same or do you do it differently after boiling? egg whites ? I ask as our family recipe includes beaten egg whites folded in at the last and I noted your recipe no whites. Do you mean egg yolks or am supposed to use the egg whites? Thanks - I am looking forward to trying this. Where did you get the beautiful glass? I made this tonight and it's super! It still has to sit overnight but it already tastes fantastic. I've decided to also make it for my in-laws as a Christmas present. Thanks for the non-raw egg recipe. It was pretty quick and easy! Oh I can't wait to try this this year. Thank you! What type of rum did you use? Spiced or dark? Sounds like a great holiday drink. good lord. This was the best eggnog I have ever tasted. thank you so much! Hi Katie, visiting you for the first time from a link. I had to come and have a look at this recipe. I absolutely love it! Really gorgeous sounding and your pics are yummy to look at! How many servings does this make for? 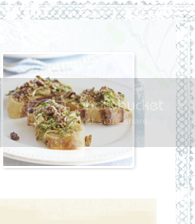 I love this recipe and cannot wait to try it! Thank you so much!!!! Hi there this looks delicious, just wondering how many servings this makes? The recipe is entitled Eggnog with Vanilla Vodka and Kahlua however the recipe doesn't mention either of those ingredients. I'm confused! 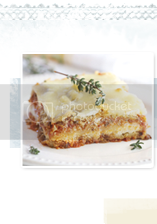 This recipe looks delish and I'd love to try it! Quick question tho. The recipe calls for 6 egg yolks but then in a later comment you mention egg whites. Which is it? This was a huge hit at my holiday party this weekend! I was wondering, some recipes have you stir in the cream with the milk in the first step. I wasn't paying attention, so I did this. Thankfully it turned out great, but I was wondering what difference it would have made if I'd waited until the end as instructed? Okay, I made this twice. It is good, however, I don't find a need to cook it back on the stove to cook, once the boiling milk mixture has been added. Other than that, this recipe has a great taste for a quick version. I have avoided making eggnog the past couple of years because I've always used a very old school recipe that uses the egg white, whipped and folded in. That one is still the best, but I will definitely use this one when pressed for time. Thank you! This eggnog was the best!! Better than store bought to me and hubby. Love that we don't have to wait till Christmas now :-). Thanks for sharing!! Okay, I'm a little confused. The recipe calls for egg YOLKS, but there are quite a few comments that mention using egg WHITES. So, which part of the eggs should I use? ?